At LEARN we’ve been reflecting on how best to increase student engagement in school, as it has been closely linked with academic achievement and students’ perceptions of their ability to succeed. One of our initiatives has been harnessing the power and appeal of the Maker Movement in the school context. To this end, we’ve been inviting teachers to Open Creative Space days at our offices and also working directly with teachers and their students in classrooms. We’ve also done whole-staff ped days at schools where there is interest in setting up a Makerspace or Open Creative Space. Working closely with teachers and students has been rewarding and has allowed us to refine our thinking about Making in schools. 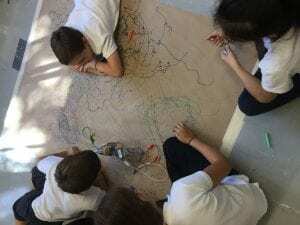 This post discusses one of the main ways we’ve been introducing Making to teachers and students – our STEAM Challenges – and explores how these challenges are just a pathway into a more holistic view of Makerspaces. 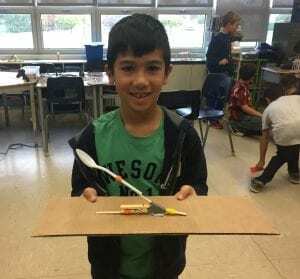 Do Makerspace activities fit into the QEP (Quebec curriculum)? At LEARN, we have been addressing many of these concerns by working with teachers and students on a series of open-ended challenges. These STEAM challenges allow for many ways of proceeding and for many possible discoveries and end products. Typically, we plan nearly a full day with a class, starting just after recess and often going until the end of the day. In that time frame, we are able to have 3 challenges blocks of about 45 minutes each, with an intro and a debrief at the end. We work with teachers remotely to choose the challenges offered to students, and ideally students pre-select their top three challenge choices from the 6 or 7 options offered to them. Each challenge is set up on its own table or pod and comes with a laminated challenge card which gives students the goal of the challenge and a basic overview. We circulate and give students clues or ask questions to help them get started or help them over hurdles. Sometimes, students will need to have the goal of the challenge explained to them in more detail. All our challenges and the challenge cards can be found via our working blog ocs.learnquebec.ca. Let’s be clear about one thing. The challenges are hard. They involve skills the students don’t have for the most part. They involve concepts that students may or may not have been exposed to, and often very peripherally, such as the idea that batteries provide power to devices, and come in many different shapes. Teachers who see the challenges for the first time are often surprised. Students who see the challenges for the first time are often surprised – “But what do we have to DO?” they ask. But, in spite of this, there has not been a single group of kids who have been unable to complete the vast majority of challenges in the timeframe provided. So far, the reactions to our LEARN Challenge days have been unequivocally positive. Teachers like the challenge model because we bring all the necessary materials with us and offer a wide range of challenges. Many teachers appreciate learning along with their students, and having us handle the immediate pedagogical aspects allows them to see how they might do it in the future. We also work in their own spaces: classrooms, Makerspaces or libraries. But if there were ever any doubts as to the success of the challenges, they would be dispelled upon witnessing the reactions from the students. From students spontaneously shouting out “This is the best day EVER!” as they get their ArtBot to draw, or their robot to follow the course they programmed for it, to clamouring for their teacher to take a video to send to their parents, to spontaneous hugs received in the hallways… Every day we spend with students, we are recommitted to growing the hands-on experiential Maker Movement in schools. Every time we see a student who struggles academically experience success, we are re-energized about our work. 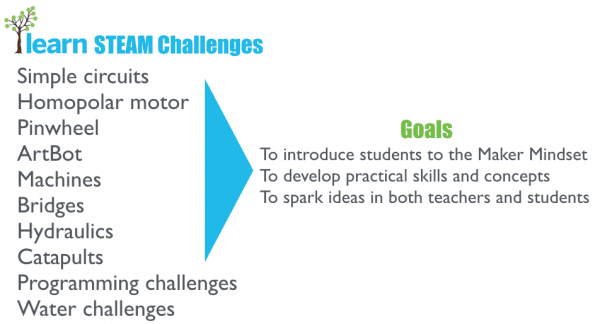 Ultimately, though, the goal is not to have all students doing STEAM challenges ad nauseum. The challenges, after all, are just somewhat less structured activities, which, while making them an excellent first foray into the Making journey, do not stem from students’ own passions and ideas. The challenges give students exposure and above all, basic skills. 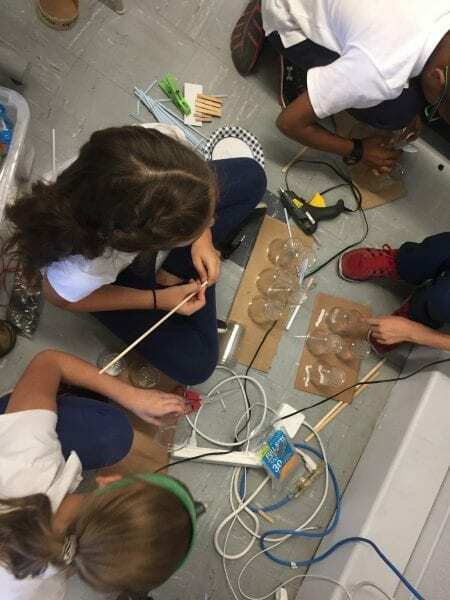 When coupled with a growth mindset in the classroom, these three elements combine into a powerful cocktail of creative potential that can find free rein in an unstructured makerspace or open creative space, where there are no challenges, only materials, time and distributed expertise. Is Making a panacea for all the ills of education? Probably not. But the transformative power of creating has the potential to breathe new life into our system and ignite passion for learning. We’ll take it. Webinar by littleBits and Brian Pichman that offers a great introduction to starting a library makerspace and looks at how littleBits can be used to help students get creative while learning about circuits and electricity. I love this blog. Well-written and thoughtful. When I was out in Vancouver 2 weeks ago, I heard teachers saying I brought my students to the Maker Space to help them understand certain key concepts and because the kids have fun there. The Maker Space/Open Creative Space was not just a place or an event, it really was integrated into the learning process…learning by doing. The ties to the current catch of the day, Deep Learning, are evident and incontrovertible. Congratulations to our ped consultants and all those who have worked so diligently to introduce this into our schools across the province.